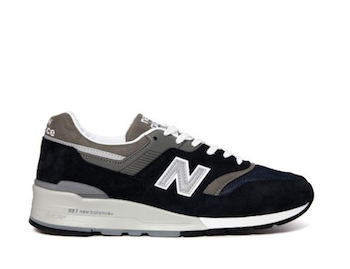 The New Balance M997 is a 1991 masterpiece that's back in its made in the USA form again for this season. A pinnacle performance design 23 years ago that preempts the M998 design, we've seen the upper on an 998 sole as the Kanye co-signed 997.5 design, but now the shoe and the shape are here in a navy colourway that looks good with everything.That lettering on the sole, the shape and the quality are a perfect combination recreated flawlessly. That pricetag is heavy, but it's well worth it on this one.